Portfolio Performance Metrics is designed to measure the performance of financial funds under the active portfolio management approach. The balanced scorecard consists of the quantitative metrics, asset allocation metrics, and risk adjusted return metrics that measure the performance of the portfolio. Portfolio metrics are risk adjusted opposed to absolute return, used in the passive portfolio management approach. 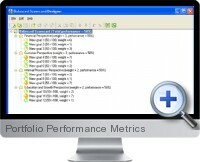 Portfolio Performance Metrics for Excel allows the designing of the balanced scorecard template based on portfolio management preferences and dynamics. The appropriate choice of performance measures may depend on the role of the portfolio under question that can vary significantly. The metrics can represent the whole investment fund or its fracture, or a sub-portfolio of many portfolios. Strategy map types supported - including snowflake, vertical and horizontal trees. Check Balanced Scorecard Toolkit for scorecard designing instructions and Key Risk Indicators (KRI) Toolkit for risk management included. Designed for active portfolio management where economic and financial indicators are used for making predictions about the market. The active portfolio scorecard can be used to monitor the performance of the portfolio relative to an investment benchmark index.